Something that I've realized since entering the blogging world, sharing only the surface of our marriage does not do justice to either of us. 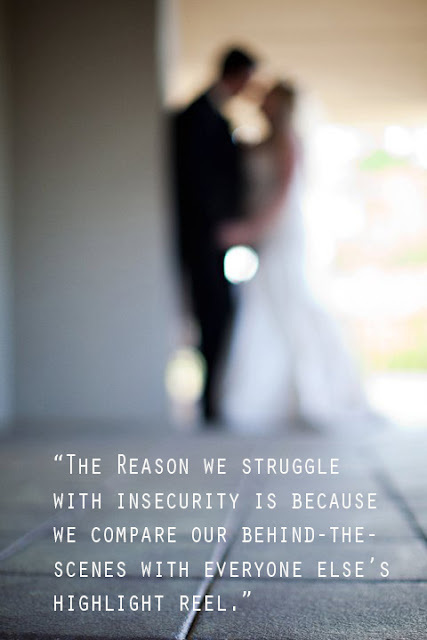 In honor of our first wedding anniversary I'd like to share some thoughts on marriage. I've geared these thoughts toward both single and married readers. Our wedding day was only one out of the past 366 days that we have spent as husband and wife (leap year). 1/366 - is a pretty small fraction. I say this because I have found that many of us put too much time into dreaming about the wedding, rather than preparing for the marriage. Avoid the race to get married at all costs. I promise you this, if you rush into marriage, or end up living with someone that you aren't actually compatible with, you will feel far more alone than you ever could imagine as a single person. Some of the things that life threw at Jake and I during our first year of marriage would have left us in pieces if we didn't fully trust and unconditionally love one another. On the outside looking in, it is easy to imagine that things are perfect for us married people. It isn't. But if you're lucky - it is rewarding. Don't be so hard on yourself. You are not alone if you have cried yourself to sleep once or twice during your first year of marriage. It is normal if the sound of your spouse's chewing makes you want to jump out of a second story window. Do you ever feel guilt for not being the perfect partner? Me too. Social media and blogs are often used as a place to share our highs. Pictures when we look our best, stories of our lavish vacations, Instagrams of the best meal we have eaten in months. While these snippets are fun to share, they do not make up the majority of our lives. The truth: I have dishes piled up in my sink and the floor of my closet is completely covered with dirty laundry. Something valuable that I learned during our first year of marriage is to take the time to celebrate one another. As adults, it is rare that others will pat you on the back, even when you may really deserve it. Be the person who gives your spouse credit where it is due. You wash more than your fair share of dishes. When I get down on myself, you remind me of who I am. You acknowledge the fact that I am the best car dancer in the history of the world. You build me up even when I may not deserve it. I am so grateful for your endless supply of patience. We made it through the dreaded first year! Happy anniversary. P.S. I am guest blogging today over at Great Expectations! Check it out by clicking here. Happy Anniversary, I like your post. Sounds like you found yourseld a great guy! Happy anniversary! Such a cute post! And that quote? Dead on! Great post...thanks for sharing such honest words. Happy Anniversary and congrats on your first year! Happy 1 year anniversary! That's such great advice! Happy Anniversary! What a great post. It's good to hear that not everyone's marriage (especially the first year) isn't always sunshine and rainbows. None of my closest girlfriends are married so it's hard to talk about marriage with them. Thanks for the honest post! And I think you and I are both lucky women to have snagged these Koneman men! Zach brightens my days routinely, it's in their blood. As an "old married" lady it's interesting to read your experiences. We didn't rush into marriage - dated for 5 years before getting engaged, by the time we were married we'd been together for 6 1/2 years. Our first year of marriage didn't have any trials and tribulations, because we'd already been through everything in those dating years. We grew up together in those early years and one of the things I've always said is that our marriage is as strong as it is because we had all those hard relationship foibles before we were married. After going through all of them, we knew that we could be together forever. Excellent quote, I love it. I have dirty dishes piled in my sink, laundry all over the place and under the couches? We just cross our fingers and pray nobody looks under there. Happy (belated) anniversary. Sounds like you and Jake got off to a solid start on your long journey together.